After a few days off, the Summer 2014 Plunder of Souls Blog Tour resumes with a post at my “home” blog, Magical Words. Today’s essay is called “The Writing Life: Living With Success and Failure,” and it is about the ways in which writers define their triumphs and setbacks. Too often, outside influences force those judgements upon us. The truth is, in a profession as difficult as this one, success has to be, at some level, self-defined. Read more at Magical Words. And enjoy. I was on the road yesterday, driving home from North Carolina after a fun and successful signing tour that began with a book launch party at ConGregate in Winston-Salem, and then took me to Rock Hill, SC, Gastonia, NC, Richmond, VA, and Raleigh, NC. Along the way I reconnected with old friends, and met some new ones. It was a great trip. But I did miss out on telling you all about yesterday’s stops on the Summer 2014 Plunder of Souls Blog Tour. So let me tell you about those, as well as about today’s stops. Yesterday I was the blog of my good friend Stephen Leigh, with a post about minor characters who assert themselves and become major characters. The post can be found here. I was also at Magical Words again, with a post about some of the odd things people sometimes say to writers. You can read that post here. Today, I am once again at Drey’s Library with a post about the books on my enormous and growing “To Be Read” pile that I am most excited to delve into. That post can be found here. And finally, but definitely not least, I also have a post up at SFNovelists that touches on the best part of my recent signing tour: the fact that I was accompanied, at least for some of it, by my fifteen year-old daughter. That post is called “Notes from the Road: The Shared Journey,” and you can find it here. I hope you enjoy them all. Today on the Summer 2014 Plunder of Souls Blog Tour, I’m back at Magical Words — my “home” blog — with a post on plotting. Sometimes the hardest thing about writing in a series, particularly in one that consists of stand-alone novels, is keeping stories fresh as well as entertaining. My post at Magical Words is about five things I do to keep my narratives new and interesting. You can find the post here. I am also visiting with my friend Brandy Schillace with a post about research and “Striking Research Gold.” I’ve had some great discoveries as I have pieced together the history for my Thieftaker novels, and that was particularly true as I worked on A Plunder of Souls. You can find the research post here. I’ll be at ConGregate this weekend with the official A Plunder of Souls Launch Party, and then I begin my summer 2014 signing tour. Stay tuned!! Release Day on the Blog Tour!!! Today is release day for A Plunder of Souls!! So go ye forth and buy the book — in book format, as an audio book from Audible, or as an e-book. Or as more than one of those!! The Summer 2014 Plunder of Souls Blog Tour makes several stops today to mark the release. I’m at Magical Words with a post about character development, specifically Ethan’s interactions with Sephira Pryce. That post can be found here. I’m also at the blog of my friend Mary Robinette Kowal with a post about “My Favorite Bit” — the part of the new book that I love the most. It’s a feature Mary does on her blog with lots of authors and it really is a fun post. That one is here. And last but not least, the good folks at SFSignal have invited me back for a post about the history behind my historical fiction. That post can be found here. More Posts Up and the First Thieftaker Giveaway of the Summer!! Two big posts up today in the continuing Summer 2014 Plunder of Souls Blog Tour. The first is at Magical Words, the site on the craft and business of writing that I co-founded and still maintain with my friends Faith Hunter and Misty Massey. The post is on the origins of A Plunder of Souls in the short story “A Spell of Vengeance,” which was published at Tor.com in 2012. You can read the post here. The second post is at All Things Urban Fantasy, who have welcomed me back for the third straight year. I’m grateful to them. This post is a fun one: it’s an interview with Ethan Kaille, the hero of the Thieftaker books, conducted by the Boston Gazette, the leading Whig newspaper of the time. And it gets better: in addition to the post, there is also a contest. I’m giving away a signed, hardcover copy of A Plunder of Souls to some lucky reader! So visit the site and enter the contest!! And good luck. Today, the Summer 2014 A Plunder of Souls Blog Tour shifts into high gear, or at least into a higher gear. I have two appearances on the schedule today. The first is at the blog of my wonderful friend, Faith Hunter, who (along with Misty Massey and me) is one of the co-founders of the Magical Words blog site. The post is about creating rich, believable, compelling settings for urban fantasies. I am also interviewed today at Fantastical Imaginations, a wonderful genre-oriented site run by my friend, Dominick Swennen. The interview covers a good deal of ground and was fun to do. I hope you enjoy it, as well as the post at Faith’s site. And for those of you not keeping track of the minutes, as I am, the July 8 release of A Plunder of Souls, the third book in the Thieftaker Chronicles, is only eight days away!! Woot! And you don’t even have to wait that long to make sure that you have your copy ready; you can pre-order it now!! The first week of the Summer 2014 A Plunder of Souls Blog Tour is winding down, with this post, which is not on the official schedule, but which counts anyway. My Blog Tour, my blog, my rules. This was a quiet week — next week things begin to pick up. I’ll be visiting the blogs of Faith Hunter and Kate Elliott, and I’ll also be a guest at Fantastical Imaginations, All Things Urban Fantasy, Black Gate, and Drey’s Library. And I’ll be starting a month-long appearance at my old virtual stomping grounds, Magical Words. There will be original content at all of these sites, so be sure to check in. For a complete listing of the blog tour appearances with links to the sites, go here. As the July 8 release of A Plunder of Souls approaches, I have also started my teaser countdown on Facebook. Yesterday I linked to the short story that serves as a prequel to the new novel. The short story is called “A Spell of Vengeance,” and it can be found at Tor. com, where is was published in 2012. Also at Tor.com, you can find the first two chapters of the book. Starting tomorrow, and continuing on a daily basis until the release, I’ll be adding passages from the book to my Facebook page. Finally, I would like to direct you to the appearances page on the D.B. Jackson website, which I have recently updated to reflect the latest plans for my signing tour, as well as another conference appearance, about which I’m very excited. In October, I will be an instructor at the Annual Conference of the South Carolina Writers’ Workshop. I’ve attended the SCWW Conference several times before and have always had a great experience there. I’m looking forward to this year’s meeting and hope to see many of you in Myrtle Beach. For more details, go here. That’s all for now. Have a great weekend. And please preorder A Plunder of Souls! A Post Goes Up and a New Short Story Drops! 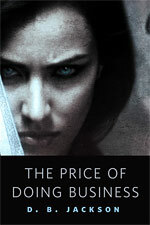 Today, I am back at Magical Words, the blog on the craft and business of writing that I co-founded with Faith Hunter and Misty Massey, writing about creating characters, and celebrating the release of the newest Thieftaker short story, “The Price of Doing Business.” The story can be found today at Tor.com. It is about Ethan Kaille’s first encounter with the lovely and deadly Sephira Pryce, who would become his rival in thieftaking and his arch nemesis. The post can be found here. I hope that you will check out both the story and the post, and I hope that you enjoy them both. I have spent the past several weeks finishing one book, revising another, and writing the early chapters of a third. For the last few days I’ve been proofreading the galleys for yet another novel, A Plunder of Souls, the third Thieftaker book. Busy times, but as any writer will tell you, busy is good. It’s nice, though, to be posting again, and I hope that this marks the first of more posts to come in the coming weeks and months. In the meantime, I hope you enjoy today’s essay.